Hello children. It’s almost that time of year when the burning scotch of Scotch is just right to take that cold edge off your walk from the Metro. But which Scotch will you take? Either for yourself or as a Christmas present for your grandfather/tweedy professor/hipster boyfriend (gender normative! )…you don’t want to make them think you don’t know what you’re doing! To help with the decision making, I have attended three Scotch tastings (free samples giving in some of DC’s non-seedy liquor stores) and have the results for you right here. Sit back, warm an empty snifter in your hand and think about which Scotch will fill it. The first tasting was Compass Box at Central Liquor in Penn Quarter. First, let me say that Compass Box is a blended Scotch, so please don’t go around calling it a single malt [malted barley made in a single distillery]. Of the three whiskys I tried, the most surprising and exciting Scotch was the Orangerie, a light, sweet blend steeped with zest of orange. Now, this would normally be a terrible idea. Some serious Scotch drinkers balk at even adding ice to their drink, and these jokers want to add orange?! But wait…it works. Compass Box has a reputation as an innovative [read: crazy] distillery, and here they have succeeded. If you need to bring a special bottle to a Christmas party this season, bring this guy. Serve over ice with some St Germain and seltzer and you will have a winner. 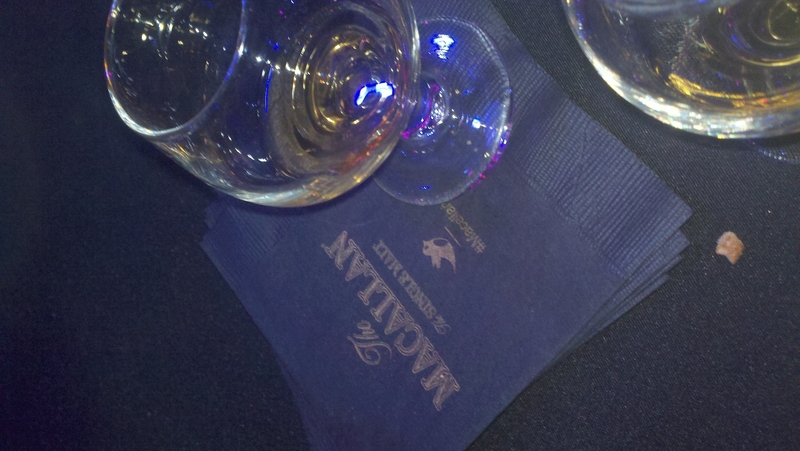 The next tasting was The Macallan at Ibiza. Yes, you read that right. I was drinking rich whisky in the place “where young men and women come to be robbed of their dignity.” Our guide to the evening was a delightful Scotsman who had some great jokes for the crowd. You’d think he does this for a living of something. The most interesting of the Macallans was the Sherry Oak 12 Year, which had an oaky smoothness to it that contrasted nicely with that signature burning. The Scotch is aged in sherry barrels from Spain, so it is a little sweeter than others. Of four tastings, the only other that stood out was the 18 Year for its incredible smoothness. But for buying purposes, color me uninterested. The last tasting was of the Bruichladdich at Modern Liquors in Mount Vernon. First, understand that Scotch tastes like the place from which it comes–the water used to make the whisky is different in different parts of Scotland. So this whisky, from the island of Islay (eye-la), has a distinctly briny, stony taste to it. Bracing is the right word for The Rocks: it’s meant to be drunk on the rocks and it made me think I was tasting rocks. Again, not a huge fan. For my money, I’d bet on Compass Box all the way here, kids. Either the Oak Cross or The Spice Tree for more traditional, semi-smoky blends. And the famous Compass Box The Peat Monster is as smokey as it gets (and a good gift for someone who is constantly saying, “I’d like it a little smokier” as you cough up a lung next to them). Previous Post Meatballs: Whose Balls Are These? I love a good scotch review. For my tastes, I tend to prefer Aberlour for single malts, and Sheep Dip when I am drinking blended scotches. They both are very smooth. However, the best whiskey I’ve had recently is Jameson 12 year old special reserve. I know it’s irish instead of scotch, but it’s really good. Full of notes of vanilla, burned sugar, pepper, and oak. Thanks David! Excellent ideas–always more to explore with Scotch!